I did have second thoughts about my planned road hack yesterday when I stepped outside to find it was raining down pellets of ice from the sky, but went ahead anyway. We tacked up quickly and I went with a quarter sheet just in case it did start to come down harder. We headed up the road and turned off into some new fields that I liked quite a bit. Tris was less than pleased with his lot in life: he had thrown a little spooking tantrum when a flock of birds took off underneath his nose, and the wind was starting to pick up and the icy pellets were actually picking up. Fair enough! That still didn’t excuse the jigging and the refusal to go where he was pointed. So I didn’t feel too bad for him when he flung himself around and onto an icy patch and slipped. I was asking him to go around it, after all. New galloping field! This photo doesn’t really convey the depth of it. 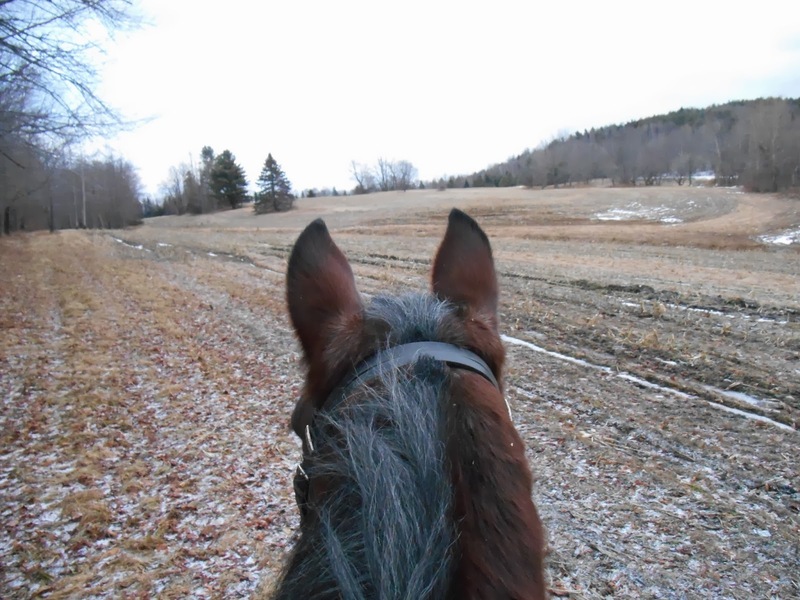 We also had a fairly stringent conversation heading back down the road toward the barn about walking calmly and quietly when there was ice and snow on the road, especially going downhill, Tristan. Let’s just say I was glad I had opted for a saddle on this particular ride. It's so annoying when horses decide to misbehave when the footing is poor. Sometimes I swear I think they know it makes us more nervous/crazy! Looks like a lovely place to ride especially when it gets warmer. Don't you love it when they bring some sass- ugh! What a beautiful view tho! Seriously, right? Most other days he goes where he's pointed, and he picks the icy footing day to assert his independence? If I hadn't been so worried/annoyed, I probably would have laughed. I love it! I had sort of known there were some big fields that way, and while hacking down the road between them (there are equal-sized fields on both sides) met the farmer who owns them, and he told me he loves having horseback riding in them. I just had never, for whatever reason, gotten out in them yet. I'm really excited about them, and to see how far they go! It's a little unusual for him! His version of sass is usually to plant his feet and just refuse to move, rather than bucking or being actively naughty. I do wish he'd been a little better behaved on such a bad footing day. It's tough to find a bad view around here. I love it.